Jedburgh Sheriff Court, Jedburgh Justice of the Peace Court. 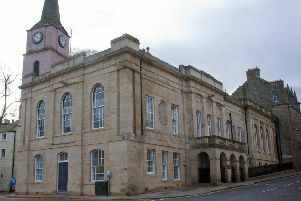 A 37-year-old Galashiels man was sentenced to 28 months in jail on Monday, April 3, in Jedburgh Sheriff Court after admitting to a large bank fraud. Between August 2014 and August 2015 David Jeffrey fraudulently opened eight accounts at banks in the Borders under various names, and obtained funds to the amount of £66,000. Jeffrey pled guilty in court and was subsequently sentenced to 28 months in prison. Detective Constable Angus Hood, from Police Scotland’s Financial Investigations team, said: “The police investigation revealed that David Jeffrey carried out a calculated fraudulent scheme over a period of one year, allowing him to obtain funds totalling over £60,000.